January 2, 2011 — Light-Sport Aircraft market leader Flight Design is pursuing additional professional organizations as representatives as the country slowly emerges from two years of deep recession. Building on dealers added during the downturn, the new initiative includes both aircraft sales outlets and service centers for the entire United States and aims to better serve more than 300 owners of CT-series Light-Sport Aircraft. The entire management team from Flight Design USA and Flight Design Germany will be present at the upcoming Sebring LSA Expo over January 20-23. “We would like to speak to businesses interested in working with Flight Design and will be available all during the show,” noted Flight Design CEO Matthias Betsch. Matthias Betsch also said that the company is nearing completion on a proof-of-concept four seat model of the CT series and expects to show the new aircraft for the first time at Aero in Friedrichshafen Germany in early April, 2011. “Following the German debut, we will bring our four-seat concept aircraft to AirVenture Oshkosh.” Betsch observed that aviation companies with a vision for tomorrow want to work with a best seller and a company that offers a range of aircraft. The Flight Design CTLS is a modern, all-carbon-fiber Light-Sport Aircraft with a wide, comfortable cabin and unparalleled visibility; flying 135 mph for 850 nautical miles using only 5 gallons per hour. 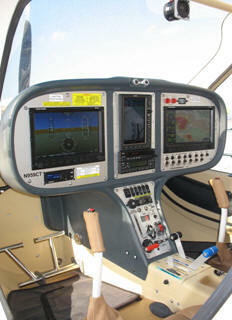 A full glass panel, Garmin radio stack, and a BRS airframe parachute are all standard equipment. Flight Design LSA are backed with a nationwide service network, next-day parts availability and an established company serving more than 1,500 airplanes worldwide. Three times a CT has been flown around the world.